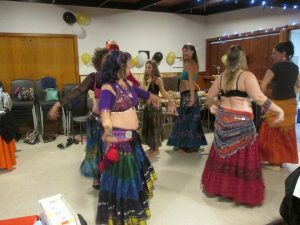 Gypsy Caravan Tribal Style Bellydance is a form of movement which is improvised in a group around a set of pre-learned steps, movements and combos using non-verbal language to signal the changes. By taking turns to lead and follow and really watching the leader, the group moves as one being, one tribe, one formation of beauty and expression. Some of the steps date back to ancient times of women’s dance in India, Middle Eastern and African countries, some are inspired by Flamenco and some are more modern expressions of the beauty of this tribe. It is a wonderful, organic, symmetrical form of tribal style belly dance and was developed by Paulette Rees-Denis from Portland, Oregon, who has spread the knowledge and teaching of GCTB around the world so that it is an international language of movement – GCTB dancers who have never met before may lead and follow each other doing the same movements and combinations of steps without even having to say a word to each other. Inspiring! 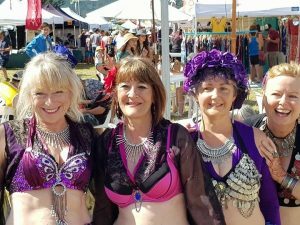 Catherine teaches classes, private lessons and courses from Level 1 – 4 in Whitianga, New Zealand. Come and immerse yourself in the dance which celebrates womanhood, tones and strengthens abs and your whole body and gives a fun way to escape everyday cares. Get in touch via smile@catherinecorcoran.com for details of current classes or to book a private lesson.